One key piece of documentation that can help your case against someone who is concealing income or assets is a loan application. When borrowing funds for homes, cars, boats, or business investments, people are often required to disclose details of their personal finances. This usually includes disclosing monthly or yearly income, as well as the value of assets such as homes, vehicles, real estate, and business interests. This information is especially useful to refute claims made during the divorce or child support proceedings. In those proceedings, people are prone to underreport their income. 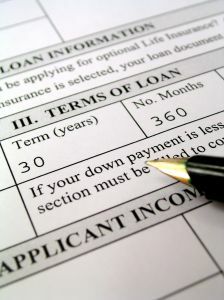 When applying for bank loans, the goal is often to show high income and assets. A loan application may help prove that the income and assets are higher than the amounts disclosed in the court proceedings. But what if the applicant lied on the loan application? It is not unusual for the subject to tell the court that the loan application is an unreliable document and alimony or child support should not be based on that data. It may be stated or implied that “everyone” lies on those documents in order to get approved for loans. This is not usually a persuasive argument. Even if it is persuasive, the result is that the subject has admitted to being untruthful. And most loan applications from banks indicate that lying on such forms is a crime. This certainly does not put the subject in a good light. Loan applications can be a valuable weapon in child support and divorce cases. They can point to the true income of an individual, help uncover assets that were previously unknown, and possibly expose the subject as a liar.